Though many travelers get a taste of ancient Maya culture with a trip to the ruins, few travelers really experience the culture, in an actual Maya village. With this full-day cultural tour, meet a Maya shaman, participate in action-packed jungle activities, and enjoy a typical meal prepared with traditional ingredients. 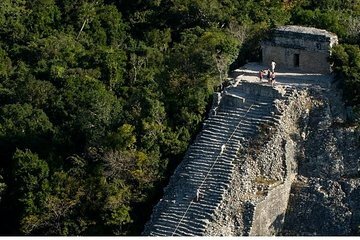 After experiencing the Maya village, tour the stunning archeological remains of the ancient Maya civilization, climb the tallest Yucatan pyramid, and take in unparalleled views of the untamed jungle. This expedition is not suitable for handicapped people, or people who suffer heart respiratory or back problems. People under the influence of alcohol or toxic substance won´t be allowed to participate in this expedition.